"You have not been very nice to me lately..." stated my husband the other night as we were getting ready for bed. The truth is I haven't been. Yeap, I have been a big grump. I have been prickly, sharp, and critical...mostly to him. Poor guy. We take out our frustrations on the ones we love the most. I haven't started 2018 on the right foot or with the right heart. Frustration has continued to saturate me like a sponge in a sink full of dirty dishes. My husband's honest remark poured over conviction and highlighted pride in my sinful soul. As I woke up to a new day, I asked for forgiveness from my Heavenly Father and from my husband. Thank you, God, for always giving us a new day. A fresh start. God and His grace ushered me into the book of Psalm to remind me what is most important to Him and what should be most important to me. 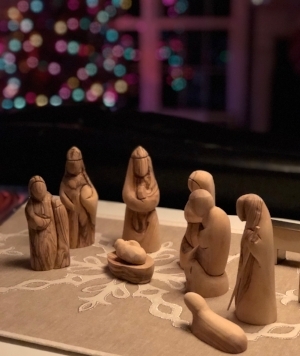 "Oh, sweet Savior, you washed away my heart of stone and refreshed my spirit with your reminder that peace in you wipes away a critical flesh-worldly heart. Amen"
I wrote in my Bible next to the verses in Psalm, "Overwhelm my heart, flood me, oh Jesus." Yes, this is what it is all about. Praising our Lord and loving Him fully. Sisters, praise God and sing a new song to Him. Declare His glory and salvation. Allow our Jesus to love you, so He can overwhelm your heart. Once we allow Him to flood us and overwhelm us, we can pour out His Love-Truths on others. Will you allow Jesus to love you? Will you allow Him to overwhelm your heart? Friends, it is so freeing. My word for 2018 is "Peace." The word "Peace" entered into my heart over a month ago, but boy, I haven't been living it lately. I will discuss more on God's peace in the next few weeks. Do you have a word for 2018? If so, please share in the comments. Giveaway Winner: I want to thank all who commented on last weeks blog post. I appreciate your support. The winner is...Leigh Ellen! Congrats!! There I stood, watching and waiting and observing my "twinkle-eyed" friend, Harrison. I witnessed such love in the breaking and passing of bread. I was not the only one in the wait, someone else took note, too. We both approached my friend. He looked at me with those eyes of Jesus. The Love speaks and twinkles through Harrison’s eyes and oh, the smile of joy. He broke the bread and passed it to the "new friend," she insisted on handing the piece to me, but Harrison knew to serve her first. I said, "Please take it." and she did. As the bread was being passed Harrison referred to me as "His Angel." As the "new friend" took the piece of bread she asked, "Why do you call her that?" With his beautiful joy-grin and the eyes of dancing, he boldly states, "Because of who she is AND Who she knows." Oh, the tears poured into my soul. If Harrison only had known my heavy heart. The "new friend" looked at me, and there I saw it...those eyes...dancing, twinkling, and she asked, "Are you a Christian?" I replied, "Yes, I am." I didn't need to ask her the same; the joy oozed out of her. Joy danced into the broken-bread isle. We laughed, we high-fived, and Church arrived. We talked, we shared, and Peace hovered over the three of us. I turned and saw the line forming for a piece of the broken bread. No telling how long those folks waited but I do know they felt the presence of the One. I hugged the "new friend" and told Harrison I loved him and stepped away. Friends, healing happened in my heart of hurt in the broken-bread isle. The past month has been raw, sad, and a piece of my heart broke off due to an event that happened that is not mine to share. As I walked out and reflected on the moment in my local grocery store, it struck me that love pours out day in and out from Harrison in the broken-bread isle of Wegman's. No surprise Jesus placed him there for such a job as this: Harrison breaks bread and gives it to folks for body AND spiritual nourishment. Harrison passes Jesus-Hope, our Saviors-Love, and Peace-Truth to each person who is willing to receive the Broken-Bread of Life. This is not the first time I have written about Harrison; however, the precious moment in the grocery store struck me and stuck with me. I had to pass it to you. Break the Bread of Life and pass it to others, my sweet friends. Community and fellowship happen when we break bread with others. Love and gentleness walk in and intertwine hearts together. Jesus, our Broken-Bread. His brokeness gently steps in freedom. Such sweetness in His love. Pass it on, share, and pour out the Cross-Love on others. 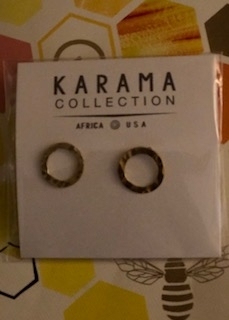 Giveaway: The Karama Collection is a company that brings dignity and purpose to artisans living in Nairobi, Kenya. I own a pair of these earrings and wear them all the time.